By Dedrick D. Henry, Sr. The Miami Dolphins defeated the New England Pat-riots dominating the second half for the 33-20 victory. The victory comes on a dominating performance in the second half, with 23 unanswered points. The game opened perfectly for the Dolphins, Tom Brady and the Patriots’ offense were unable to do anything with the ball, and were forced into a three-and-out punt. Dolphin’s rookie linebacker Chris McCain made his first impact play of his career on a punt, by blocking it and setting up Miami with good field position. Miami found the end zone with a six-yard pass from Tannehill to Lamar Miller. The Dolphins took an early 7-0 lead. The Patriots would not trail long, orchestrating an 80-yard drive to tie the score. A 17-yard end-around by Julian Edelman, but most of the 13 plays were short passes and runs, riddling the Dolphins defense on their way to a 7-7 tie game. Tannehill connected with Mike Wallace on a short crossing route, only to have Wallace drop the ball with New England recovering the fumble. Miami’s first injury came late in the quarter as Dannell Eller-be was forced from the game on the first play of the New England drive. New England was forced into a field goal with a 47-yard kick from Stephen Gostkowski taking a 10-7 lead. Ryan Tannehill threw a poor pass toward an open Mike Wallace deep down the field only to be intercepted by Alfonzo Dennard. yards down the field. Typical Tom Brady. The Dolphins took over possession but Lamar Mil-ler fumbled the ball and Patriot’s Darrelle Revis recovered. Miami had three straight possessions end by turnovers by the mid-way point of the se-cond quarter. The Dolphins were able to put together their first drive moving the ball 55-yards on 11 plays, with some help from New England penalties, settling for a 38-yard field goal from Caleb Sturgis, closing the gap to 17-10. The Patriots took the ball for the final possession of the half, moving the ball down the field and giving Gostkowski a chance at a last second field goal. New England had 20-10 lead at the half. As the game went into halftime, the Dolphins were without linebacker Koa Misi who out of the game with an ankle injury. Miami received the opening kickoff of the second half before driving 65-yards down the field, unable to score settling for a 24-yard field goal from Sturgis, bringing the Dolphins to within a touchdown of New England. 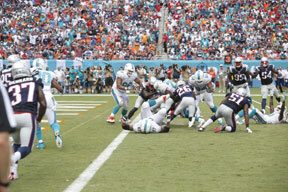 Cameron Wake stripped the ball as he sacked Brady, with safety Louis Delmas coming away with the recovery. Miami rode the power running by Knowshon Moreno following the turnover, before Tannehill was able to find Wallace for the 14-yard touchdown pass and a tie ballgame. New England would go three-and-out on their next possession. After a short punt, rookie receiver Jarvis Landry was able to return the kick to near mid-field and to give Miami good field position to start the drive. Miami settled for a field goal on the drive, but the three points were able to give Miami a 23-20 lead. New England would again have to punt on their next drive, with rookie McCain making his second impact play of the game, this time coming up with a sack of Brady and forcing a punt. Miami would go three-and-out on their next drive. The Dolphins defense would again step up on the next New England possession. Defensive end Olivier Vernon came up with a third-down sack, forcing the Patriots into a three-and-out punt. The Dolphins followed suit, going three-and-out after allowing their first sack of the game. Miami found the end zone after another Patriots punt when Tannehill engineered an 85-yard drive, with most of that coming from Knowshown Moreno’s work on the ground. The Dolphins taking 12 plays and over six minutes off the clock, Miami extended their 23-20 lead to a 30-20 with a touchdown run from Moreno. On the next drive, Miami forced New England to go for it on fourth-and-ten. That play did not go so well for Brady and the Patriots, as Cameron Wake recorded his second strip-sack of the game, and sealed it for Miami. The Dolphins added a field goal to extend the lead to 33-20 after Wake’s sack. Brady was able to move the ball on the last New England possession of the game, but it ultimately did not matter. Miami was able to hold on for the victory and a great start to the 2014 season.